We partner with working, low-income families to help them afford a home. Our path to homeownership requires hard work, time and dedication, but this helps ensure the long-term success of the families we partner with. Families who apply and are accepted to become Habitat homeowners purchase their home through a no down payment, interest-free mortgage geared to their income and contribute at least 500 volunteer hours to Habitat. Once they move in, Habitat homeowners are responsible for maintaining their own home. We help families and individuals prepare for homeownership by providing homeowner education classes, ranging from financial literacy and budgeting to home-repair and maintenance. 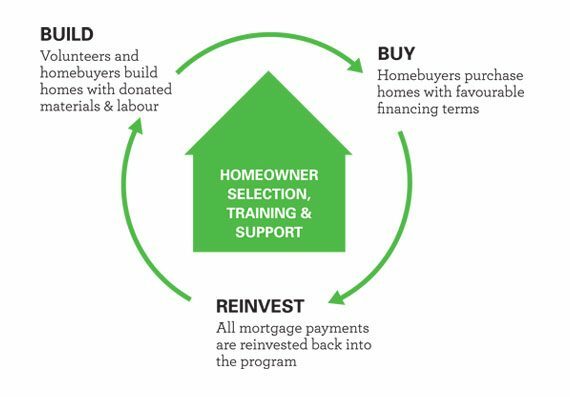 As a Habitat homeowner pays off their mortgage, the money is invested into a revolving fund, which is used by the local Habitat to build more homes for families in their community. Habitat homes are built based on modest designs, using donated materials and with the support of volunteer labour. In order to partner with Habitat, families or individuals must commit to at least 500 volunteer hours with Habitat. Habitat homeowners’ monthly payments are typically set at no more than 30 percent of their gross household income, including principal repayment and property tax. Choice Hotels Book to Build Campaign – Sneak Peek! Nice Truck! Can I have one? Our Online Donation Form is now active!